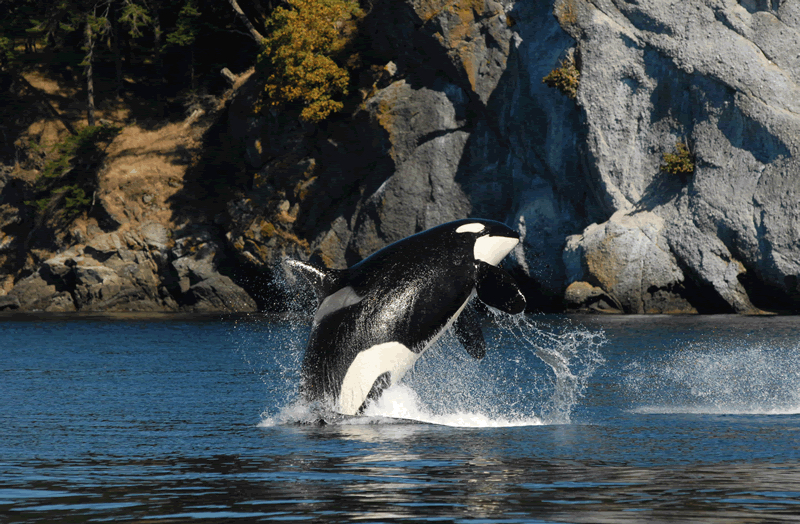 In 1997, a group of 19 orcas from L pod spent a month in Dyes Inlet between Bremerton and Silverdale. (Check out my stories in the Kitsap Sun.) There is pretty good evidence that their record-long stay in one location was at least partly because they were not comfortable going under the Warren Avenue Bridge, which was their only way out. If something about the bridge spooked the whales, then how did those 19 orcas make it under the enormous structure when they first entered Dyes Inlet? Although it has never been confirmed, observers at the time reported seeing two groups of whales coming into the inlet. I’ve always wondered whether Granny had visited Dyes Inlet long before the Warren Avenue Bridge was constructed. Could she have led both the J- and L-pod whales into the inlet, where chum salmon were abundant? Did the L-pod whales choose to stay behind to catch fish only to become confused later when they tried to make their getaway? I guess we’ll never know. When a beloved friend or relative dies, it is hard to keep going as if nothing has changed. I know there is sadness about Granny’s passing among longtime whale observers, orca researchers, educators and whale-watch boat operators. I can’t help but wonder how the orcas in J pod are coping with Granny’s loss. How long will it take to rally around a new leader? How will Granny’s knowledge be missed as the whales struggle to find bountiful salmon runs? How will her sudden departure affect cohesion among the whales, which were already breaking into smaller and smaller hunting groups. Ken Balcomb of the Center for Whale Research ponders some of these questions in a tribute to Granny, a story that appropriately recognizes the important discoveries of the late Mike Bigg, the first person to realize that orcas could be identified individually and that each whale has a story to tell. “Even in her death Granny leads by example. ‘This is how it should be,’ she tells us, even now. ‘This is when we should be parting ways … at the end of a long life.’ The tears in our eyes and on our cheeks are for the loss of a whale — a beloved friend — who has led a life whose length alone is worthy of remembrance and of celebration. “The times ahead are ones I cannot predict, for I do not have the gift of foresight. But whatever they bring — be it triumph, tragedy, or something in the middle — may we face them with the same tenacity and dignity as Granny. She lives on in the whales that still remain, in the calves that have yet to join us. She lives on in our hearts, and more importantly in our deeds. In 2006, M.L. Lyke, a reporter for the Seattle Post-Intelligencer, wrote about how she perceived Granny’s life in a series called “The Sound of Broken Promises,” now featured on the Orca Network webpage. A great story in print and video that stirs the imagination. I thank you Christopher Dunagan.